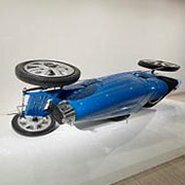 This month, we explore a curious sculpture Bugatti Type 35 (2006) by James Angus. Angus has replicated one of the most iconic racing cars of the 20th century, but tilted it by 30 degrees. Andrew Yip will discuss Angus’s fascination with slick, man-made machines, distortion and speed. The talk will be audio described for blind and vision-impaired visitors. Artwork of the Month is part of the Third Sundays at the Gallery program, a State Street Learning for Life initiative.